In the Spotlight | Brooke Industries, Inc.
Dr. Tom Kraus Dentistry recently presented the Miracle League of Fond du Lac with a $500 check. 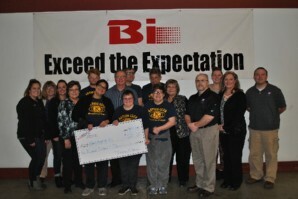 Accepting the donation were our Beacons of Hope Aktion Club members. We appreciate your support and welcome Dr. Tom Kraus Dentistry to the Miracle League of Fond du Lac team! ...Brooke Industries, Inc. provides a wide variety of production services and solutions to local, regional, national, and international customers. Brooke Industries, Inc. provides high quality, innovative service and choice to the rehabilitation and business communities. Brooke Industries, Inc. will be recognized as an industry leader promoting people, product and service through a dedicated workforce committed to high quality, value and customer satisfaction. Creativity, innovation, education and technology enhance our flexibility to adapt to market changes. Focus on the future remains the cornerstone of our company. Copyright ©2019 Brooke Industries, Inc. All rights reserved.